Event planners have a love-hate relationship with spreadsheets that’s worthy of its own Bravo TV show. The first row in your spreadsheet file should be reserved for column headers, including First Name, Last Name, and Email Address. Pro tip: This info can be dynamically pulled into your emails through Splash. Make it personal. Any guest you upload to Splash is stored in your Contacts manager, so you can also include columns like Birthday, Twitter handle, Website, Phone Number, Location, and more. With our Producer and Enterprise packages, you can use dynamic filters to curate targeted invite lists from these details. If you’re using Microsoft Excel, check out the Text to Columns tool to get rid of any extra semicolons and unnecessary characters. Or, use it to split information like First Name and Last Name into separate columns. Be sure to check for any duplicates and delete any “filler” info. Email sent to “Mr. I don’t know” successfully avoided. Whether you’re using Google Sheets, Microsoft Excel, Apple’s Numbers, or whatever came with your computer, there’s one file type that plays nice with everyone. 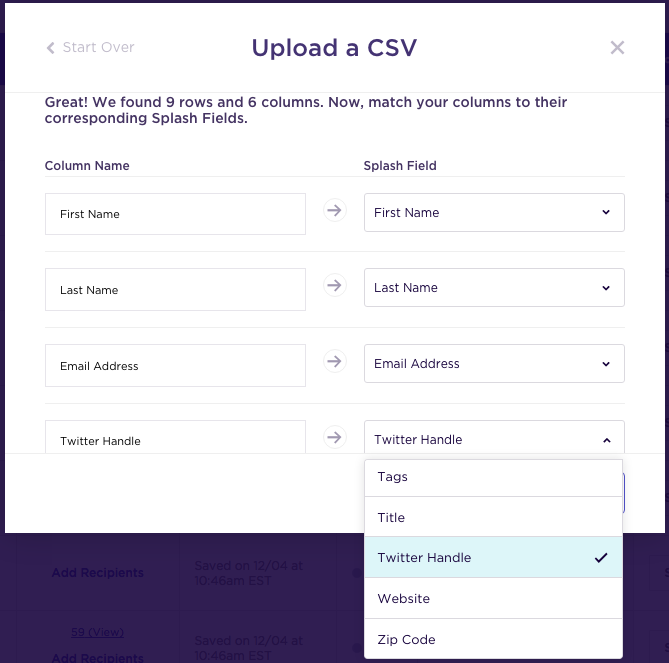 Comma Separated Values (.CSV) file type is the universal spreadsheet format that uploads best into Splash. All you need to remember is to export your list as a .CSV, shown below. Kristen Lott is a Community Manager and Support Specialist at Splash. By teaching the best practices of using Splash, Kristen empowers rockstar event marketers to craft the experiences of a lifetime and produce tangible results. She regularly manages and develops content for the Splash Help Center, and helps guide the Splash product & tech teams to provide excellent resources for event organizers around the world.